The Koho people, also known as the Caho, Co Ho, or K'ho, of Vietnam arrived as refugees in North America shortly after the Vietnam War. They are remembered for the role they played fighting alongside American soldiers. This earned them the nickname "America's forgotten army" — a more benevolent term than that by which they were known to the South Vietnamese, moi, meaning savages. Traditionally, they are a matrilineal society where children carry the family name of the mother. It is the traditional rite of a young girl in Koho society to choose her husband. Once she has made her choice, she communicates that choice to her parents. The majority of Koho in North America claim Christianity as their religion. Despite the fact that many Koho in Vietnam were converted to Christianity in the early twentieth century, spirit-worship is widely practised and each family adopts a guardian spirit from the natural world among present-day Koho in Vietnam. 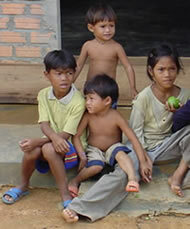 Pray God will work through and in the lives of the Koho to grow in their understanding of Jesus Christ. Pray that evangelical Koho will be light to their own people but also to the least reached peoples in North America and their homeland, Vietnam.